ICS Update for HTC Sensation & Sensation XE Available Now! Android ICS update for HTC Sensation and Sensation XE is finally available. Aside from bringing the Ice Cream Sandwich goodies, this OS update is also contain HTC sense 3.6. As you might already know, the world was thrilled when Google and Samsung announce the Galaxy Nexus, the first of it’s kind that feature Android 4.0 out of the box. It has lot of enhancement and amazing features, including face-unlock, resizeable widgets, and better multi-tasking. Soon, all Android users hope that the manufacturer will bring the Ice Cream Sandwich to their handset. So, if you’re one of HTC Sensation or Sensation XE proud owners, you must be happy with the fact that the Android ICS update for your handset is arrive at last. According to the company’s statement, the Android ICS update for HTC Sensation and Sensation XE is already start to roll out in Germany. This Android ICS update is currently packed in a single file with 238MB size. So we suggest you to use a decent WiFi connection instead of 3G to grab the Android ICS update much faster. 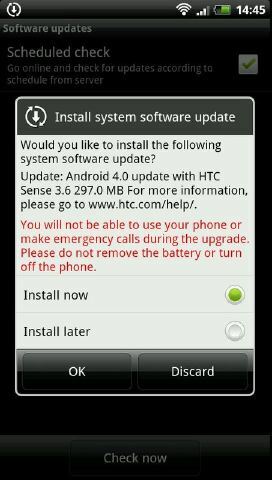 Soon after installing this Android ICS update, your HTC Sensation or Sensation XE will feature the upgraded version of HTC Sense 3.6. Since this Android ICS update is available OTA (Over The Air), users should receive a special notification about it’s availability. Fortunately, you can also check them manually by navigating to Settings > About Phone > Software update. Continue with Update now and your HTC Sensation or Sensation XE will tell you whether the Android ICS update is already there or not. So, what are you waiting for? If you own one of HTC Sensation or Sensation XE, hurry and check if the Android ICS update has already reach your handset. Have some problems during the update? Write down your Comments and we will be happy to assist you.. Author: Hassan Elyas from Android Cop.